Welcome to LinemansEquipment.com. N&L Line Equipment provides website features, products, and services to you subject to the following conditions. By shopping online or using any of our other online services, you agree to these conditions. Please read them carefully. When you use any service on this site or send e-mails to us, you are communicating with us electronically. You consent to receive communications from us electronically. We will communicate with you by e-mail or by posting notices on this site. You agree that all agreements, notices, disclosures and other communications that we provide to you electronically satisfy any legal requirement that such communications be in writing. All content included on this site, such as text, graphics, logos, button icons, images, audio clips, digital downloads, data compilations, and software, is the property of N&L Line Equipment or its content suppliers and protected by United States and international copyright laws. The compilation of all content on this site is the exclusive property of N&L Line Equipment and protected by U.S. and international copyright laws. If you create an account on our site, you are responsible for maintaining the confidentiality of your account and password and for restricting access to your computer, and you agree to accept responsibility for all activities that occur under your account or password. If you are under 18, you may use this site only with involvement of a parent or guardian. N&L Line Equipment reserves the right to refuse service, terminate accounts, remove or edit content, or cancel orders in their sole discretion. All items purchased from N&L Line Equipment are made pursuant to a shipment contract. This means that the risk of loss and title for such items pass to you upon our delivery to the carrier. N&L Line Equipment attempts to be as accurate as possible. However, we do not warrant that product descriptions or other content of this site is accurate, complete, reliable, current, or error-free. If a product offered by us is not as described, your sole remedy is to return it in unused condition. * If an item's correct price is higher than our stated price, we will contact you for instructions before shipping. N&L Line Equipment does not take title to returned items until the item arrives at our fulfillment center. At our discretion, a refund may be issued without requiring a return. In this situation, N&L Line Equipment does not take title to the refunded item. For more information about our returns and refunds, please see our Returns Policy. THIS SITE IS PROVIDED BY N&L Line Equipment ON AN "AS IS" AND "AS AVAILABLE" BASIS. WE MAKE NO REPRESENTATIONS OR WARRANTIES OF ANY KIND, EXPRESS OR IMPLIED, AS TO THE OPERATION OF THIS SITE OR THE INFORMATION, CONTENT, MATERIALS, OR PRODUCTS INCLUDED ON THIS SITE. YOU EXPRESSLY AGREE THAT YOUR USE OF THIS SITE IS AT YOUR SOLE RISK. TO THE FULL EXTENT PERMISSIBLE BY APPLICABLE LAW, N&L Line Equipment DISCLAIMS ALL WARRANTIES, EXPRESS OR IMPLIED, INCLUDING, BUT NOT LIMITED TO, IMPLIED WARRANTIES OF MERCHANTABILITY AND FITNESS FOR A PARTICULAR PURPOSE. WE DO NOT WARRANT THAT THIS SITE, ITS SERVERS, OR E-MAIL SENT ARE FREE OF VIRUSES OR OTHER HARMFUL COMPONENTS. N&L Line Equipment WILL NOT BE LIABLE FOR ANY DAMAGES OF ANY KIND ARISING FROM THE USE OF THIS SITE, INCLUDING, BUT NOT LIMITED TO DIRECT, INDIRECT, INCIDENTAL, PUNITIVE, AND CONSEQUENTIAL DAMAGES. By visiting linemansequipment.com, you agree that the laws of the state of Washington, without regard to principles of conflict of laws, will govern these Conditions of Use and any dispute of any sort that might arise between you and N&L Line Equipment. Any dispute relating in any way to your visit to our site or to products you purchase shall be submitted to confidential arbitration in Kitsap County, State of Washington, except that, to the extent you have in any manner violated or threatened to violate our intellectual property rights, N&L Line Equipment may seek injunctive or other appropriate relief in any state or federal court in the state of Washington, and you consent to exclusive jurisdiction and venue in such courts. Arbitration under this agreement shall be conducted under the rules then prevailing of the American Arbitration Association. The arbitrator's award shall be binding and may be entered as a judgment in any court of competent jurisdiction. To the fullest extent permitted by applicable law, no arbitration under this Agreement shall be joined to an arbitration involving any other party subject to this Agreement, whether through class arbitration proceedings or otherwise. 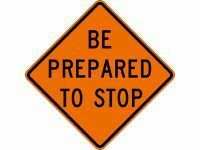 Dicke Safety Products 48" Superbright Reflective Orange Roll-Up Sign - "Be Prepared to Stop"